My favorite restaurant dish is a Chinese one, simple but amazing: steamed beef dumplings with the classic dumpling sauce. Chang Mao in Deal – their Sweet and Sour Chicken is awesome! Penne vodka, with HOMEMADE pasta! YUM! The whole family couldn’t get enough of the lamb spring rolls from Wolf and Lamb! I cant wait to try every recipe in this book! Its so exciting! My favorite restaurant dish might have to be the Honey Chipotle Steak at Serengeti in Baltimore, MD. It was AMAZING. My favorite restaurant food is Chinese. ANYTHING Chinese! My favorite restaurant dish is potato skins from Milk n Honey restaurant in Toronto! My favorite restaurant dish is the Steak Frites from Chai Ko Tapas in Teaneck it was scrumptious! One of my favorite dishes is the venison sausage pizza-style appetizer at Tierra Sur Oxnard, CA. My favorite resturant food is the Shwarma from Mizrachi Grill in Chicago. Yum! Basil fries from Basil in Crown Heights – yum! Milt’s nachos – we had them once and loved them; I tried to recreate them at home and couldn’t come close. chinese food is a favourite and anything italian!! Crispy Shredded Beef at Umami in Baltimore! Anything fleish Italian from a great kosher restaurant! One of my faves, Beef Lo Mein! Yum! But I would take spare ribs (or any good meat) over that any day! Anything from Tierra Sur in Oxnard!! (The Herzog Winery). I went once and everything was so amazing. Even the leftovers reheated were fantastic!! Specifically their steak! Pulled Brisket Sliders from Chef Aryeh Goldenson at Estreia in Lakewood. COQ AU vin according to Julia child’s mastering the art of french cooking, adapted with all kosher ingredients of course, and using slivovitz in place of cognac to light on fire! I used Facon instead of bacon, it’s O-U Glatt. I love all beef dishes with non sweet sauces. Would really enjoy this cookbook to step up my cooking for simchos. My favorite restaurant dish is a Chickpea Tomato Pasta soup I had at Ba’Ghetto Milky in Rome. It was flavorful, hearty, and different than anything I’d had before! I can’t get enough from the tropical salad at cafe k! Thai Steak and crispy shredded chicken from Chai Ko Tapas/Estihana in Teaneck! All the meat they have. All of it. Not a lot. Not a bunch. All. Reserve Cut taco appetizer! Yum! Mike’s Bistro’s Rib Eye. Awesome. The gnocchi at Mike’s Bistro in NYC — so simple, but gourmet, and melts in your mouth. Can’t wait for the next edition! Whenever I eat at a dairy restaurant, I first order mozzarella sticks. My favorite restaurant dish is nachos. The sweetbreads at Mike’s Bistro was delicious! Few restaurants offer food to match our home cooking. For instance my apple-stuffed roast chicken basted in a puree of apple juice, garlic, onion and ginger. Easy and unforgettably delicious. Any unique steak dish! Would love to see some restaurant recipes for their flavoring and tips for tenderness! Here’s a oldie but a great dish Shmulkie Burnstien’s Sino Steak. My husband wants Kosher Delight’s Southern fried Chicken. We can’t have either because both places closed and we moved to Israel, so winning this book would be amazing. What a great idea. Now I too can create these dishes at home. i love crispy beef from Japanese restaurants ! Hangar steak at le marais! Taboun’s (in Chicago) BBQ Skirt Steak- awesome tender flavorful meat! Taboun’s BBQ skirt steak is awesome!!!!! My favorite resteraunt recipe is pulled beef sliders!!! 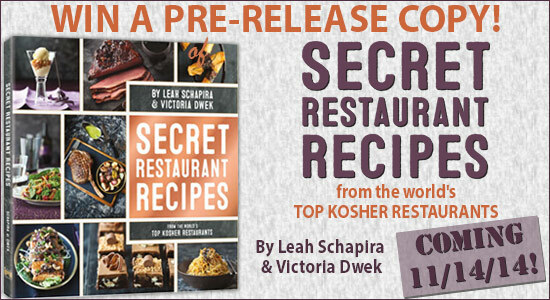 So excited for this cookbook!!! I would love to get the recipe for almost anything in china bistro in aventura, fl!!! My favorite dish was the rib steak from Solo in manhattan. Bistro special at bistro deli in great neck! Love prime grill’s duck spring rolls!! Reserve Cut taco pulled beef. We used to love the tuna ceviche at the now-defunct Kitchen Table in Mountain View. Wagu sliders from Les Marais, and duck empanadas from Mikes Bistro. We like Chinese and Italian food. Fettuccine Alfredo! Restaurants make it better! Mocha Bleu’s baked ziti is amazing. My favorite dish isd the warm haloumi cheese salad in Greg’s Jerusalem. My favorite restaurant food is grilled trout from cafe k.
The seared mallard breast at Eucalyptus. Outstanding! My fav restaurant dish is marinated beef ribs- with lots of sauce!! carlos and gabbys taco salad, delish! Alaskan Halibut @ Tierra Sur. I love the Kung Pao Spaghetti at California Pizza Kitchen! Yemenite Soup from Mabat in Teaneck. Schwarma from anywhere. Southern style trout from the Fish Grill in Malibu. I’ve had a lot of blintzes in my long, Jewish life, but none as good as the ones I had at Milky Way on Pico in LA! Glatt Alan Carte has the most amazing food! Their melt-in-your-mouth sweetbreads, grilled to perfection steaks (with choice of rub or sauce—try the coffee rub! ), amazing huge ribs, perfect garlic mashed potatoes….yum! I’ve never had anything there that wasn’t perfection! My favorite restaurant dish is the beef cheek pizza from pardes! Crispy rice and delmanico from prime grill! the surprise steak from entree!!! they only have a certain amount of them a day and its the best!!!!!!!!!!! I love general tsos chicken! A good steak. Meat id tough in Israel. A good steak is a rarity. My favorite dish from Basil in Crown Hts is their “Sweet Potato Gnocchi” OMG! Ok, I can’t pass up the “Guinness Ice Cream” made in house! I’m happy!!! My absolute favorite dish is the beef tacos from Reserve Cut. I dream about them!! Pizza Pita – Montreal – Poutine. Simply amazing.